Foundation work has begun for the construction of the Integrated Technology Centre in Immenstaad am Bodensee, Germany, an extension of the Airbus defence and Space plant. 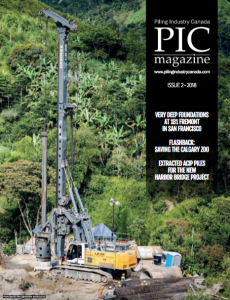 The contracted deep foundation company, Kurt Motz Baubetriebsgesellschaft GmbH & Co., is using two Liebherr drilling rigs, an LB 28-320 and LB 36-410. The machines are installing cased-drilled piles for the foundation of the new building, which measures approximately 70 by 60 metres. The single piles are 40 metres long and have diameters of 75 and 90 centimetres. The total drilling length is 7,900 metres. Digging that deep poses a particular challenge — the facility is located near Lake Constance. To avoid groundwater and seawater, the contractor built a sheet pile wall using a Liebherr piling and drilling rig (LRB 125). Both Liebherr rigs are equipped with rotary drives type BAT 320 and BAT 410. The BAT series, developed by Liebherr, provides the necessary torque for a multitutde of drilling applications. The automatic torque regulation and continuous speed optimization react flexibly to different soil conditions, ensuring optimum drilling progress. Liebherr says the rigs have smooth and precise control to provide excellent positioning in all fields of application. The electro-hydraulic proportional control enables several movements to be carried out at the same time with utmost precision. The LB 28-320 absorbs the rotary drive’s torque of 320 kNm as well as the 40-tonne push and pull force of the rope crowd system, ensuring quick work cycles. The parallel kinematics of the leader system allow for a large working radius and accurate and stable operation. Meanwhile, the LB 36-410 is the next largest model in the series and has a torque of 410 kNm. The machine weighs in at 127 tonnes. Despite its size, it’s easy to transport and has quick set-up times at the jobsite. The upper carriage is compact and designed for a small swing radius, allowing for work to be carried out efficiently even in restricted spaces.